Good morning! We have a guest blogger on The Worktop today! Kirsty from Ever So Sweet is sharing with us a bit about mornings on her worktop. 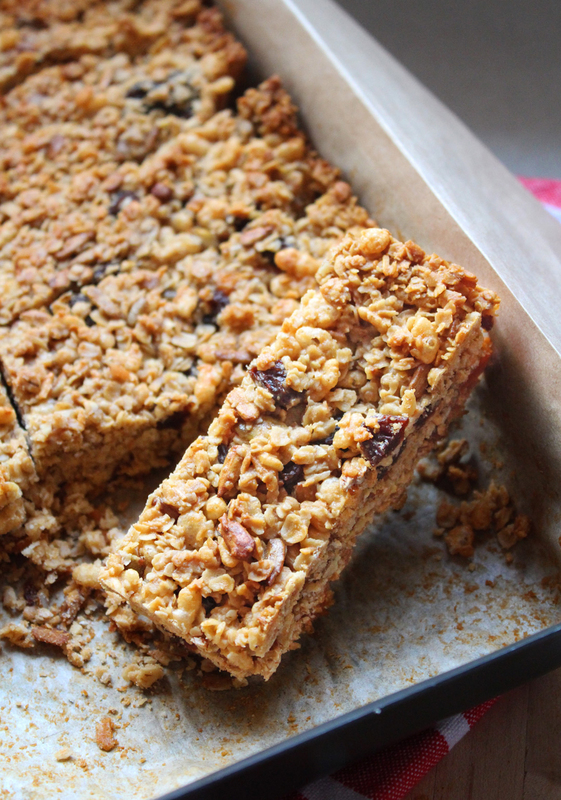 She’s also made some Peanut Butter Granola Bars with Honey, and they look delicious! You can find her recipe below. 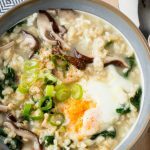 I host guest posts on The Worktop to introduce you to other food bloggers that I enjoy following. 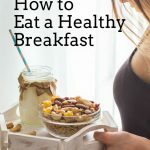 I invite them to answer a few short questions and to share one of their yummy breakfast recipes. Kirsty and I met through the Great Food Bloggers Cookie Swap. I mailed a package of my maple oat biscotti to Kirsty, and I guess they were good enough for her to swing by The Worktop and say hello. 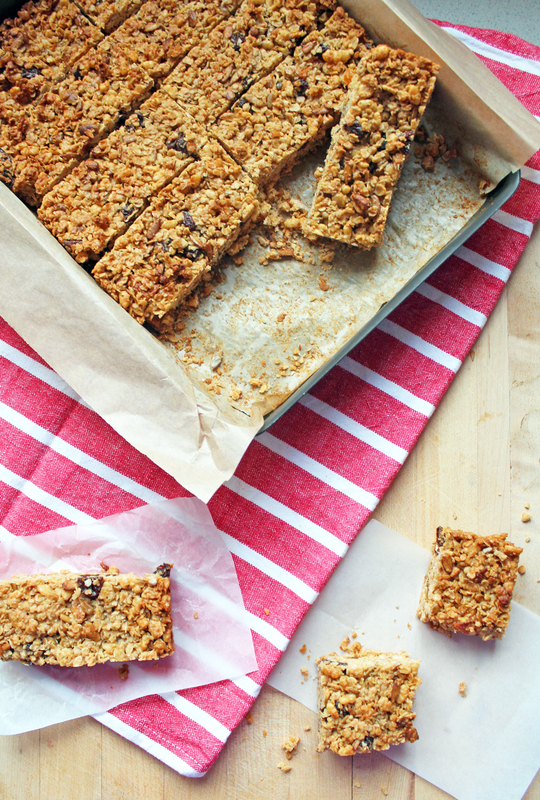 So read on, go ahead and meet Kirsty, and start drooling when you see her Peanut Butter Granola Bars With Honey! 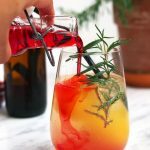 I started my blog almost two years ago, inspired by the rise of so many beautiful foodie blogs and also my growing passion for creating my own recipes. 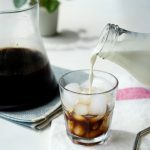 The majority of posts on my blog are sweet, baked treats which are laden with all the bad things that taste oh-so-good! 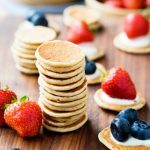 Since starting the blog I’ve discovered that not only do I love to bake and develop recipes but I enjoy the whole process – from designing my website and logo, to the photography and food writing. It’s really been a fun learning curve from the start! Looks like in addition to your blog, you sell your baked goods at festivals around the UK. How did you get started with that? What is the best seller? I do! 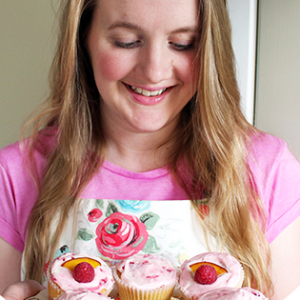 Last summer I started my own home-baking business, also called Ever So Sweet, in my home town on Inverness in Scotland. I make cakes, cupcakes and macarons to order for the local area as well as fondant decorations which I sell on my Every So Sweet Shop. My first food fair was back in July and it was a daunting experience but I had a brilliant time. It’s lovely seeing happy customers first hand. The best sellers have become French macarons, which suits me because I adore them and I love baking them as well. They are a little fiddly and took a while to perfect but now I’m not phased by churning out batch after batch. They are the perfect decadent treat. I live in Inverness which is in the north of Scotland. It’s a small city but has a great up and coming food scene with lots of local produce and products. That’s one reason I enjoy the food fairs so much because it gives me a chance to meet other small, local food businesses. The blog that started me on this path was Joy the Baker and I am still a huge fan. 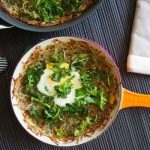 Joy’s recipes never fail to disappoint – I love both her cookbooks too. 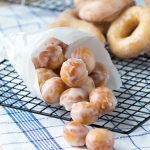 How Sweet It Is is another one of the first blogs I started reading back in the day, it’s wonderful resource for sweet and savoury recipes and the flavour combinations are always interesting and delicious. 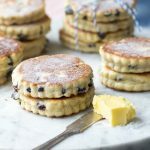 I love that there are more UK based food blogs out there. 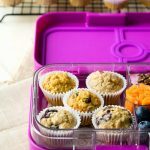 The Little Loaf is one of my favourites and I’m delighted to add The Worktop to my Bloglovin’ feed! Without fail! I can’t comprehend people who don’t, I wake up hungry almost every day! Weirdly it depends on what day it is. My workday routine I brush before, I can get a little lazier at the weekend! From Starbucks! I’m more of a tea drinker unless the mood takes me in a coffee shop. Ooh, tough because I like eggs all ways! I think fried would have to be my favourite but that’s just a rare treat. Pancakes are definitely what I love to have for breakfast. Big fluffy American style pancakes with crispy bacon, drowned in maple syrup….I’m getting hungry now! After reading my answers I’m sure you’ll be expecting something uber decadent and sugary from me. As much as I love sugary treats at any time of the day, it is January and like everyone else out there I feel duty bound to try extra hard having a nutritional start to my day (before it all goes wrong in the afternoon). 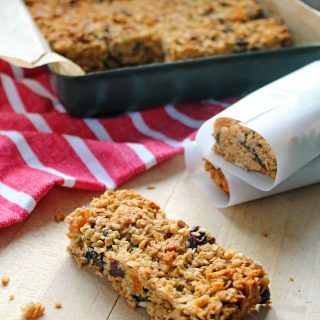 These granola bars definitely fall somewhere in the healthy category, I’ve snuck a little butter in the there but all the oats, seeds and fruit will make up for that. There is no sugar though, here the sweetness is provided by delicious honey with its distinct and subtle sweet touch. Also packed in to these portable bars or goodness is peanut butter, coconut, pumpkin seeds and dried fruit so they pack a flavour punch and will keep your hunger pangs at bay for a good few hours. 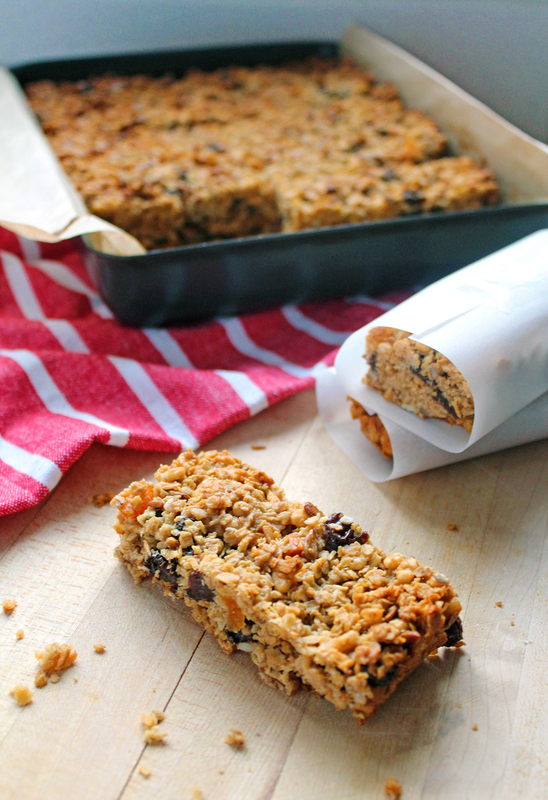 What is great about granola bars is that you can customise and tweak the recipe to suit your tastes and pantry stock. The dried fruit can the swapped from your favourite, the seeds switched to nuts, you could throw in a handful of cacao nibs or, if you’re feeling decadent, drizzle the finished bars with a little dark chocolate. Preheat the oven to 325°F / 170°C. In a large mixing bowl, add the oats, coconut and pumpkin seeds and stir to combine. Tip the contents onto a 8 x 10 inch (20 x 28 cm) baking tray and spread in an even layer. Bake for 10-15 minutes, until lightly toasted. Remove from the oven and set aside to cool slightly. In a small saucepan melt together the butter, peanut butter and honey, stirring occasionally until smooth. Set aside to cool until needed. Pour the cooled oat mixture back into the large mixing bowl. Wipe the baking tray clean and line with greaseproof paper, allowing an overhang at two edges to allow the bars to be removed from the tray easily. Add the puffed rice and dried fruit to the large mixing bowl, stir to combine well. Pour the contents of the bowl into the butter mixture and stir ensuring everything is evenly coated. Pour everything into the prepared backing tray and pack tightly with a spatula or the back of a metal spoon. Bake for 25-30 minutes until the top becomes a rich golden brown colour. Allow to cool in the tin before slicing in to 12 bars or 24 small squares. 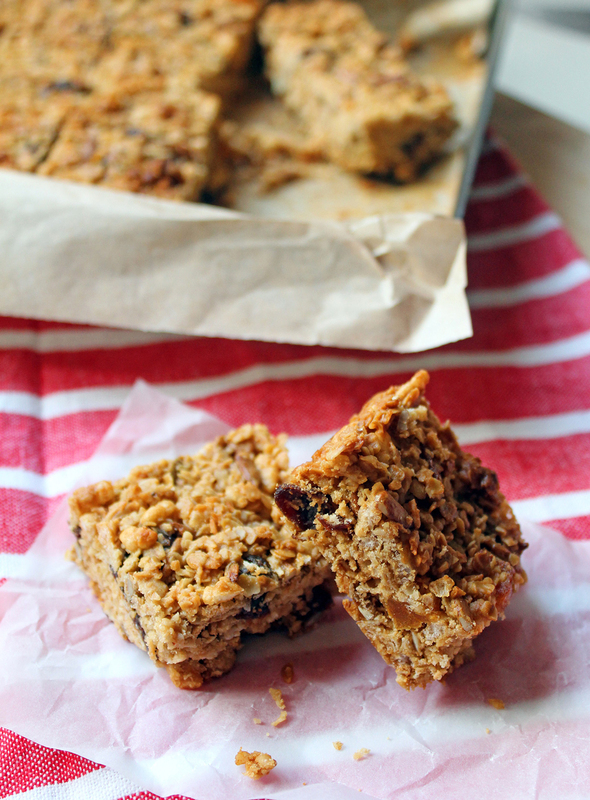 Love these peanut butter granola bars! 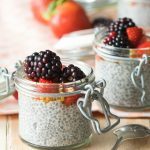 I always have healthy treats like these available for when I crave a quick sugar fix… so this recipe is ideal for me. Thanks!